Rotary success stories - New Zealand and SW Pacific: Are we really good Samaritans? 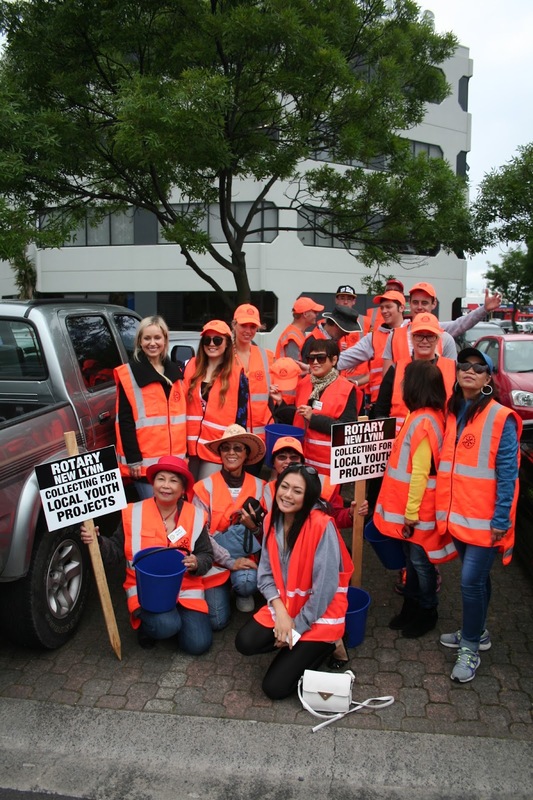 The Rotary Club of New Lynn multi-cultural collection brigade. Each year Rotary Club of New Lynn, NZ members and friends wave charity boxes at passing motorists next to a busy set of traffic lights, asking for funds to help local disadvantaged youth. The collectors are a multi-cultural mixture of all colours and genders. But it’s interesting that the most generous people, those most willing to part with their loose change, are inevitably our Pacific Islanders. Few cars driven by these folk pass without giving, yet disappointingly, the least likely to part with money are, like myself, our more mature Caucasian male elders, many not even happy to acknowledge the presence of the collector. It’s certainly hard to fathom why our island born neighbours, many on the minimum wage and trying to support large families both here and abroad, should be so generous, and equally hard to reason why those of us, who are purportedly more educated, certainly with a larger share of disposable funds, should be among those who are the most close fisted. Why is it that we in the more mature brigade don’t reciprocate our neighbours generosity. Perhaps we haven’t suffered enough hardships, endured unemployment or incurable illness and poverty. Maybe in our daily lives we only see light-hearted, bright, well fed kids and when we travel to their shores, only blue lagoons, swaying palm trees and sun. Perhaps we have become too insulated from the huge imbalances and growing inequalities in our own society and with our neighbours. Certainly, every day we read stories of children living in our Pacific Islands without adequate health or educational needs. Tales of children suffering from floods, endemics or tsunamis, without doctors or teaching provisions; children enduring unbearable ailments leading to early deaths. Our own Rotary service activity, Rotary Oceania Medical Aid for Children (ROMAC) for example, receives many more requests for help from island children needing surgery to prevent an early death or a vestige of dignity than they could possibly satisfy. Yet this same Rotary charity seriously struggles to secure adequate funding, especially from our own kindred sources. But when those same Pacific people settle in NZ, they are our most generous and certainly when asked, top the group who will give the highest portion of their income to our local kids. When we flash our charity boxes at them and ask them to help our youth in need, we invariably report more social connection and spontaneous generosity than with any other group. Perhaps as mature Caucasians we need to likewise reciprocate our neighbours generosity and when similarly faced with a donor box at the traffic lights or pay-pal request for funds on ROMAC’s webpages www.romac.org.nz and www.romac.org.au , we too need to be more altruistic. Because this philanthropic magnanimity is essential, especially if we are to have a prosperous future in our part of the world, irrespective of colour, creed, religion or race; and if we are to truly fulfill our own Rotary Objectives of being part of an organisation united in the ideal of service and providing service above self.